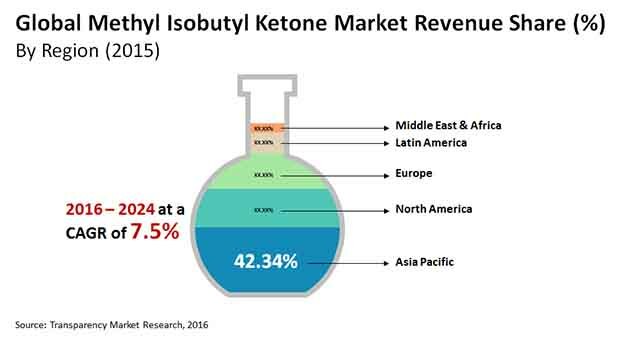 The vendor landscape of the global methyl isobutyl ketone market is largely consolidated, with top five companies accounting for more than 55% of the overall market, notes a recent market study by Transparency Market Research. These are Shell Chemicals, Celanese Corporation, LCY Chemical Corp., Kumho P&B Chemicals Inc., and The Dow Chemical Company. With a strong distribution and sales network, top companies in the market have been able to reach out to customers globally resulting in a low to medium degree of competition in the market. In a bid to strengthen their position, production of bio-based methyl isobutyl ketone (MIBK) is the focus of top companies and to expand their product portfolio as well. The global methyl isobutyl ketone market is expected to expand at a CAGR of 7.5% between 2016 and 2024 for the valuation of the market to increase from US$827.4 to US$1,572.3 mn between 2015 and 2024. By application, the solvent segment held the leading share of the methyl isobutyl ketone market in 2015 and is expected to maintain its dominance throughout the forecast period. This is because the high growth of the automotive industry has benefitted the growth of MIBK market due to the increased demand for solvents for rubber processing chemicals and surface coatings. Over the coming years, the demand for MIBK across the automotive industry is anticipated to be highly influential for the growth of the global MBK market. In terms of geography, Asia Pacific held the leading share of more than 42% in the global market in 2015. This is mainly due to the increasing demand for MIBK in crop-protection and automotive industries in India, China, and ASEAN countries. Amongst all, China accounts for the leading consumption of MIBK especially for antiozonants application. Asia Pacific is expected to display a rise in production and demand for MIBK, thereby resulting the region to hold commanding position in the coming years. North America MIBK market is expected to rise at a moderate pace as the region mainly consists of developed countries that are mature for MIBK end-use industries. Countries in the Middle East and Africa region are expected to contribute substantially to the growth of MIBK market due to developmental projects for commercial infrastructure. The flourishing growth of the automotive industry has indirectly benefitted the MIBK market for solvent applications. Methyl isobutyl ketone is an excellent solvent for resins that are used in various surface coatings in the automotive industry. Methyl isobutyl ketone is used as a solvent in industries that produce paints, chemicals, and rubber products. It is also extensively used in rubber chemicals for the manufacture of tires, surfactants, and insecticides. However, impact of MIBK on human health even in low concentrations is leading to a declining use of petroleum-based, synthetic MIBK across a large number of end-use industries. Petroleum-based MIBK have environmental concerns as well as it can form explosive peroxides on contact with air. These factors have led to an increasing demand for bio-based MIBK across a large number of applications in the recent years. The low cost factor of bio-based MIBK and its ecological viability is leading to the adoption of bio-based MIBK across a number of industries. Hence, the rising adoption of bio-based MIBK and process development in the manufacture of MIBK from plant sources is expected to extend growth opportunities to the global MIBK market.